When is a paddy not a paddy? When it's a canvas. Mysterious “corn circles” of incredible complexity that appear overnight, or a baseball park as in the 1989 film “Field of Dreams” — who knows what you might come across in your local rural idyll these days. But travel some 600 km north of Tokyo, then take a drive off the beaten track. There, in a village in verdant Aomori Prefecture, who would ever expect to find exquisite Edo Period artworks sprouting amid a swaying green sea of enormous rice paddies? It’s neither a dream, a supernatural mystery, nor fiction. Instead, by precisely planting four varieties of rice with differently colored leaves in fields their ancestors have farmed for centuries, the people of Inakadate Village have this year grown remarkable reproductions of famous woodblock prints by Katsushika Hokusai (1760-1849). And this is no cheap gimmick — the images from the artist’s “Fugaku Sanjurokkei (Thirty-six Views of Mount Fuji)” on the 15,000-sq.-meter paddies are nothing if not spectacular in both their scale and detail — even as every day brings them nearer to annihilation in the September harvest. From ground level, the artistic paddies spread out before the Inakadate Village office building are, like those corn circles that crop up in England at this time of year, invisible. However, by scaling (for free) a 22-meter-high mock castle tower that’s part of the village office and overlooks the fields, visitors are rewarded with a view that takes their breath away. And, as a boon to the local economy, it’s a field of dreams as well, with around 150,000 visitors drawn to the village of 8,700 souls in the last few months alone. “People who see this for the first time often ask me if we made this by painting colors on green rice plants,” says Akio Nakayama, who leads the rice paddy art project, while viewing the multicolored rice fields from the village office. Nakayama, an official of the office’s industries section, has been working on the art project for more than 10 years. 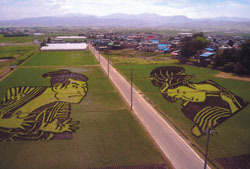 Inakadate Village started to create rice-paddy art in 1993 as a local revitalization project. No one will take credit for the idea, which seems to have just grown out of meetings of the village committee. 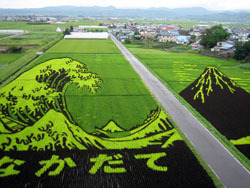 In the first nine years, the village office workers and local farmers grew a simple design of Mount Iwaki in Aomori Prefecture every year, accompanied by the words “Inakadate, a village of rice culture.” Then, by planting rice varieties with different colors of foliage on about 2,500 sq. meters of rice paddies, they quite literally brought their designs to life. But as time went by, the locals’ horizons widened and the pictures they tried to transform into fields of art became more and more complicated. Not surprisingly, over the years more and more people also began to pay attention to their extraordinary endeavors. Then, in 2005, after agreements between landowners allowed the creation of enormous, 15,000-sq.-meter rice paddies, the villagers painstakingly plotted their planting on paper plans and created huge-scale reproductions of Edo Period ukiyo-e works by Sharaku and Utamaro. That year, around 130,000 visitors sought out this beautiful backwater to marvel at the arable artwork. Last year another revolution occurred in this creative corner of the northernmost prefecture of the mainland of Japan, when the village organizers of the paddy pictures for the first time used computers to precisely plot planting of the four differently colored rice varieties that bring the images to life. The result was an astonishing set of reproductions of paintings from the famous “Fujin Raijin Zu Byobu (Wind God and Thunder God Screens)” by the early Edo Period artist Tawaraya Sotatsu, and also some 200,000 visitors who went along to see the grass images. “I feel happy to see many people come to see our rice paddies because, here in Inakadate Village, rice and people’s lives are very closely connected,” Nakayama says. In fact, he says the idea for this “modern” project came out of the village’s ancient history of rice cultivation. “In 1981, when we did construction work for a new road, we dug up some rice paddies that archaeologists dated as being about 2,000 years old. That impressed us local people a lot, because we realized how long people have been growing rice in this place. From that germ of an idea sprang the paddy-art project, which has come to involve not only local farmers but many of their friends and neighbors, too. So now, every year, the project starts in April, when the pictures to be planted in Inakadate Village’s rice paddies are decided upon at local meetings. After that, six staff at the village office make an elaborate plan of how to plant different colors of rice to create the image. They calculate and plot the precise areas where each different color of rice needs to be planted in the paddies, and produce a printout of the design that at first just looks like a mass of dots. “Using computers has greatly shortened the time it takes to calculate the position of one dot on the rice paddies,” Nakayama says, referring to the markers needed to determine where to plant each of the different rice varieties. “At the same time,” he adds, “it has made it possible to calculate many more dots to draw the picture more precisely. Dots on a printout are all very well — but the most sensitive and difficult task is digging reed sticks into the bare spring paddies at exactly the right points so that those who plant the rice know where to position each of the four varieties. This year, five groups of six village-office staff dug some 6,100 reed sticks into the ground, then strung plastic tape between them to create the areas — some large, some only a meter square — in which to plant the rice varieties. Altogether, the task took three full, backbreaking days. Then, on May 27, a total of 700 people took part in the rice-planting event. They included 50 visitors from outside the prefecture — people from as far afield as Hokkaido, Kanagawa and Osaka — alongside 450 from nearby towns and villages. Divided into teams, they used four kinds of rice: two ancient varieties called ki ine (yellow rice) and murasaki ine (purple rice) that grow into yellow- and brown-leafed plants respectively, and also more modern Beni Miyako (Red Miyako) and Tsugaru Roman, an Aomori variety with a fresh-green color. 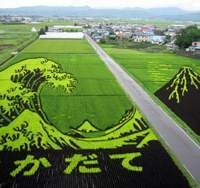 After that, the artworks were in the hands of nature as the seedlings began growing in varying hues into Hokusai’s famous wave amid Inakadate Village’s sea of swaying rice plants. But whatever defects such experienced eyes may detect, the number of visitors flocking for their free view of the paddy-artists’ amazing, living creations just keeps on increasing. So far this season, with a month to go before the harvest, more than 150,000 visitors have already found their way to Inakadate Village, 10 km east of Hirosaki City, to view Hokusai’s wave in verdant Technicolor. On weekends, especially, locals are outnumbered by the 6,000 to 7,000 visitors. While it may be busy now, Inakadate Village is bracing itself for an even bigger influx on Sept. 30. Then, as the cool breezes of autumn bathe the land, it’s anyone’s guess how many will turn up to take part in the annual harvest. Last year, around 900 people from across the country harvested about 2 tons of Tsugaru Roman rice, which was given to those who took part and to those who helped with the spring planting. 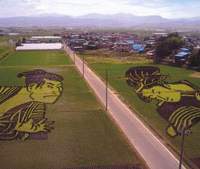 Then, as one year’s transient beauty is cut down, Nakayama and other Inakadate Village officials will begin turning their minds to next year’s artistic crop — and to hosting seminars at the request of other farming communities around Japan on the practical details of creating rice-paddy art. So what form of art will grow in their rice paddies next year? 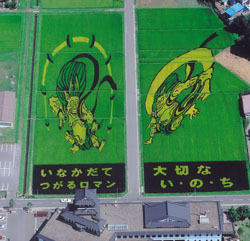 Inakadate Village welcomes anyone who wants to take part in this year’s harvesting of the rice-paddy art on Sept. 30. To apply to join the event, call the village office on (0172) 58-2111, and ask for the sangyo-ka (industries section).